While out testing an audio recording software on my iPad a bird is singing close by. So I record it. When I start editing I realize that the bird answers to the audio on the iPad. So I grab my phone and try to document this cute conversation between the bird and the iPad. Or… the bird and itself. I’m using MultiTrack DAW on the iPad. A Røde Video Mic and an IcematAudio external USB audio capture card connected to the iPad camera connector kit. EyeFi + iPhone personal hotspot + ShutterSnitch works! The SX230HS is small enough to be way more practical than the 5D for certain trips. And good enough to be worth carrying in addition to the camera already in the iPhone. But I also need the speed and simplicity of publishing that the camera in the phone gives me. So I was plesantly surprised when I could conclude that my EieFi-card talks directly to my phone when the personal hotspot is activated. If I run ShutterSnitch on the phone while the hotspot is active it happily receives images directly from the camera when I turn it on. There are some issues with a lost connection after some inactivity but I’ll keep experimenting. The images in this post are snapped with the SX230HS, transferred directly to the phone, edited and and added to the article. Everything on the go. The worst iPhone lens ever. Or? A couple of months ago I bought this telephoto lens from Dealextreme. I had very low expectations and my initial tests proved that it was even worse than I had in mind when ordering. As you can see from the image the distortion is horrible and it doesn’t even cover the whole image. But today I discovered a scene that would benefit a bit of telephoto. …the machine between the houses. So I mounted the lens and did some experimenting. I got closer. No doubt about that. And with Picture Show, Tilt Shift Generator, Camera+ and Photo FX I could have a bit of fun as well. I was kindly allowed to use music from Philter on some of my latest time lapse experiments. Magnus Gangstad, the man behind Philter is working on his new album. And has just released his latest music video on Vimeo. The album is due in May. This sounds (and looks) promising. Philter – Revolver (OFFICIAL MUSIC VIDEO) from Philter on Vimeo. And vote this one UP on Reddit here. One year in 2 minutes from Eirik Solheim on Vimeo. Link to video on YouTube. Visit The Philter Lounge to download and listen to more amazing music by Magnus Gangstad. Update: By popular demand. Both from the comments and from twitter. The version with no zoom-effect. Link to video on youtube. The next video I made was done in 2007 and with a Canon 400D. Based on stills shot at irregular intervals. That video got more than two million views on YouTube, one million on Vimeo and was featured on CNN, The Weather Channel, NHK in Japan and countless other TV stations, web sites and exhibitions. In 2009 I documented the changes with video clips shot with my Canon 5D Mark II. The three videos I made are closing in on one million views and have also been featured on TV, in commercials and music videos. But none of these three projects have been a true time lapse. They’re not videos based on a camera that has snapped images at regular images all through one year. 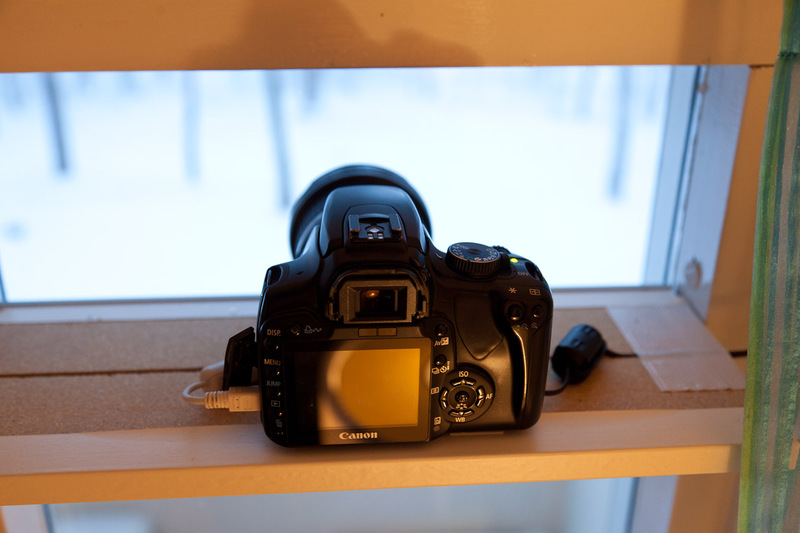 I placed my old SLR in our window in january last year. Hooked it up to our home server and gave it power through an adapter. Then I used software to control the camera. It has snapped one image every 30 minutes for one year now. Both the Mac and the Camera was hooked up to a UPS as well. I have lost a couple of images due to some computer crashes and camera crashes. But in general the system has been remarkably stable and given me more than 16 000 images to play with. The first thing I did was to make a still image showing a whole year. The camera was my trusted old Canon 400D with an EF-S 10-22. 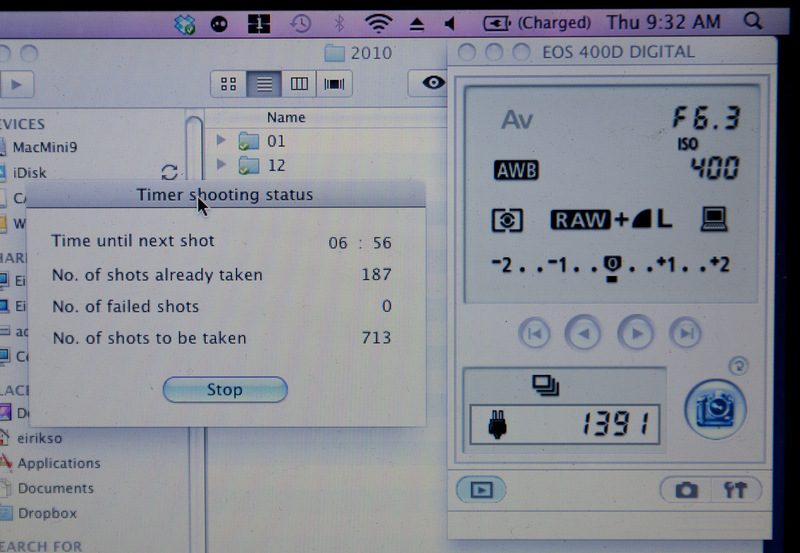 Used for several years before I bought my 5D Mark II. 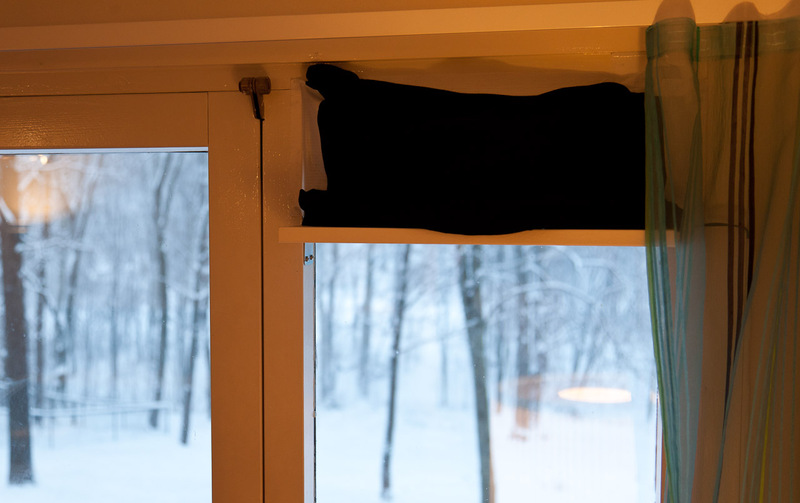 I mounted it on a special shelf and covered it with black cloth to avoid reflections in the window. I actually glued the camera to the shelf to make sure it wouldn’t move for a year. Then I did some test shots and ended up with ISO400 and f6,3. 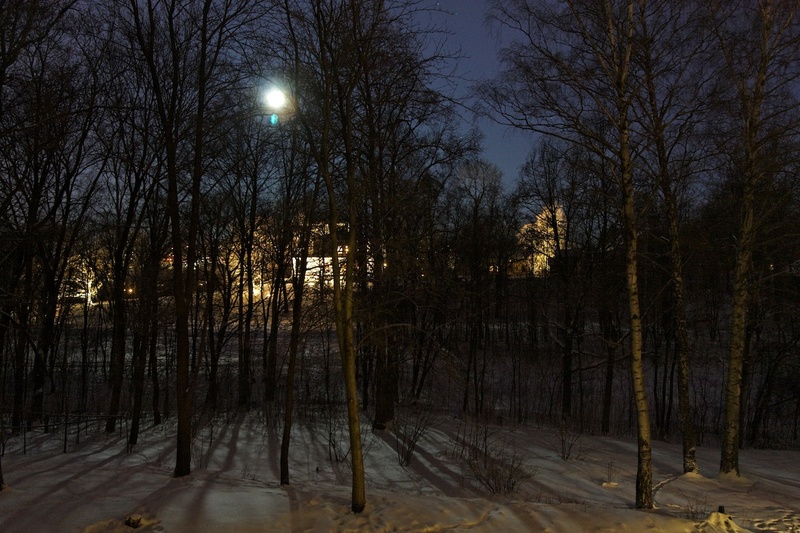 The exposure time was set to auto along with the white balance. I decided to shoot both RAW and high quality JPG. The only problem I’ve had with the camera is a couple of crashes while it was transferring the image to the computer. Something that could only be solved with a complete reset of the camera. Not turning it off and on again. But cutting the power completely and power it back on. One of the things I wanted to do was to make a true time lapse. The first video is the two minute version that you saw at the top of this post. It’s made of images shot during the day all through 2010. First I added all the images to Apple Aperture. In general I prefer Adobe Lightroom, but I couldn’t do all the time based selections and searches I wanted in Lightroom. So, I used Aperture to select images. I exported all images taken between 0900 and 1400 because I wanted daytime images only for this video. Then I imported them to Lightroom to do some adjustments. 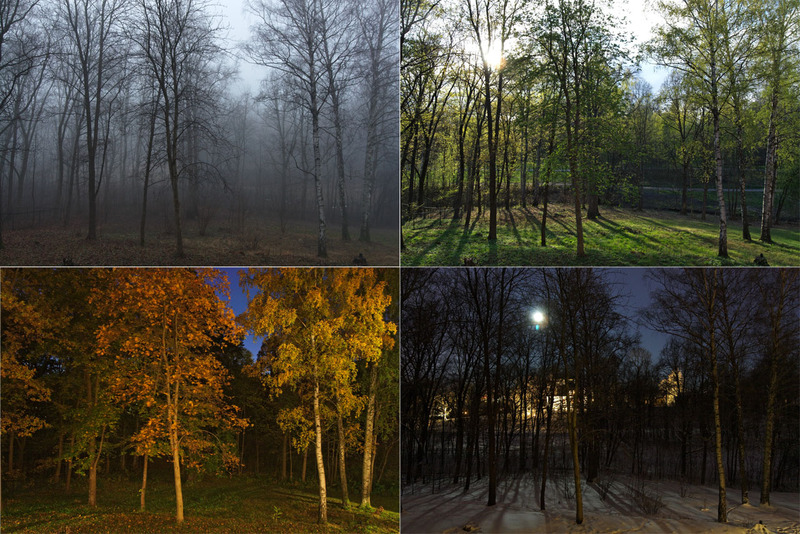 Better white balance, some sharpening, lens correction etc. Then I exported all the images as TIFF to a folder. To make a movie of all the stills I imported them to MPEG Streamclip and exported a QuickTime using the lossless Apple Intermediate codec. 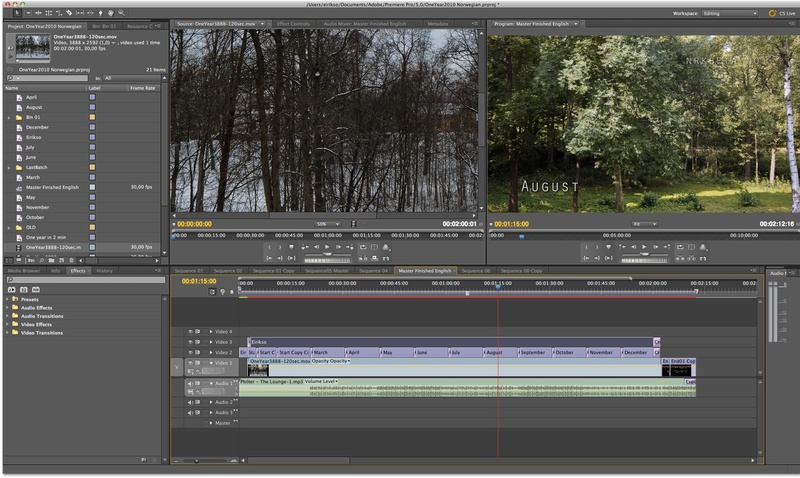 That huge 3888×2592, 30fps video went into Adobe Premiere CS5 for finishing. That’s where I added the music, text and slow zoom. Because the original image is very high resolution I could do a digital zoom even on the 1920×1080 video I wanted to make. The downloads and commercial use? It is licensed with a creative commons license. Meaning that you can use it for whatever as long as it is non commercial, you give me credit and you share any alterations with the same license. I’ll also make a full quality version with no eirikso.com-logo available for purchase to the people that want to use the video commercially. Contact me on eirik.solheim at gmail.com for pricing. What about the night shots? Update: the videos I made from the same footage is here. I’m currently working on a new time lapse project. Not a sort-of-time-lapse. But a true one. 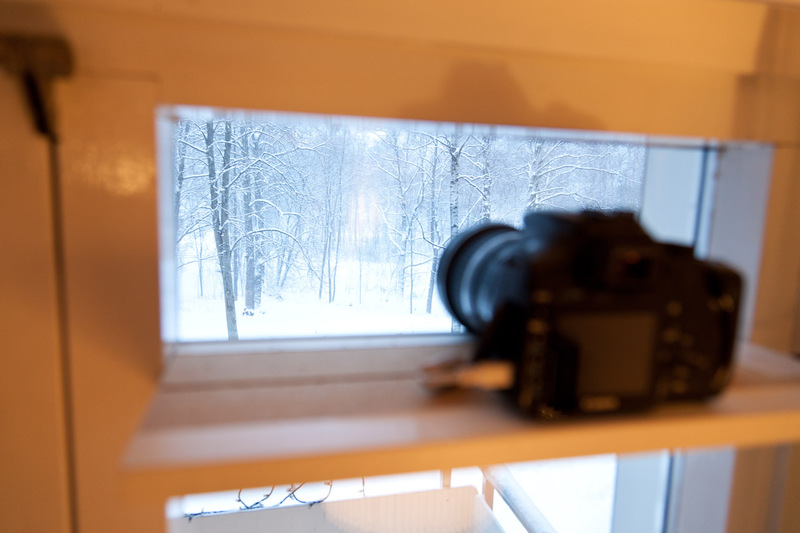 To put it short: I’ve had an SLR camera in my window at the same spot for one year. Snapping an image every half hour. Resulting in some pretty nice time lapse videos I’ll post here in a couple of days. But first a still image. The resolution of the 16 000 images I now have from 2010 are 3888×2592 pixels. So I selected 3888 images snapped during the day. Then I got some generous help from my blog readers and twitter followers. To make a script that would take one line from the first image, the next line from the next image and so on. Jo Christian Oterhals, Nikolai Kristiansen and Aslak Hellesøy provided complete code for the solution. You can click it to make it bigger. It shows one whole year. January at the left and December to the right. 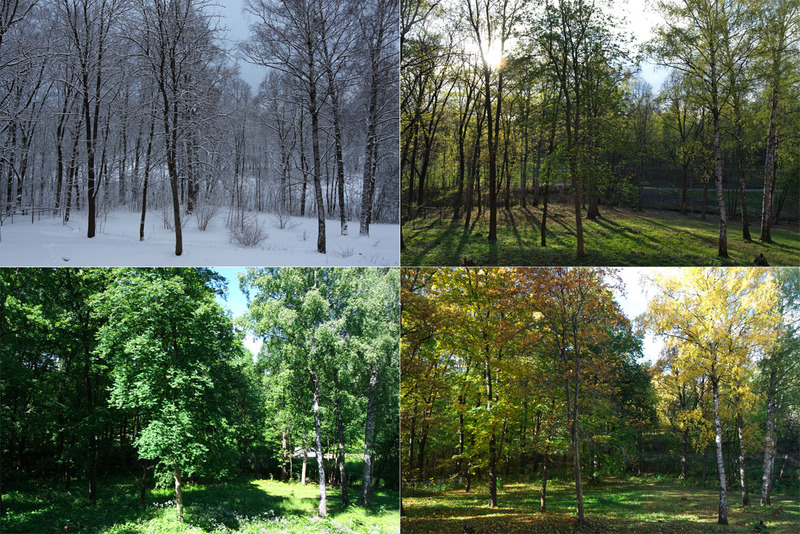 You can clearly see that we have a pretty long winter and a decent summer here in Oslo, Norway. The spring and autumn are both quite short. I have now posted the full 3888 resolution image on flickr. 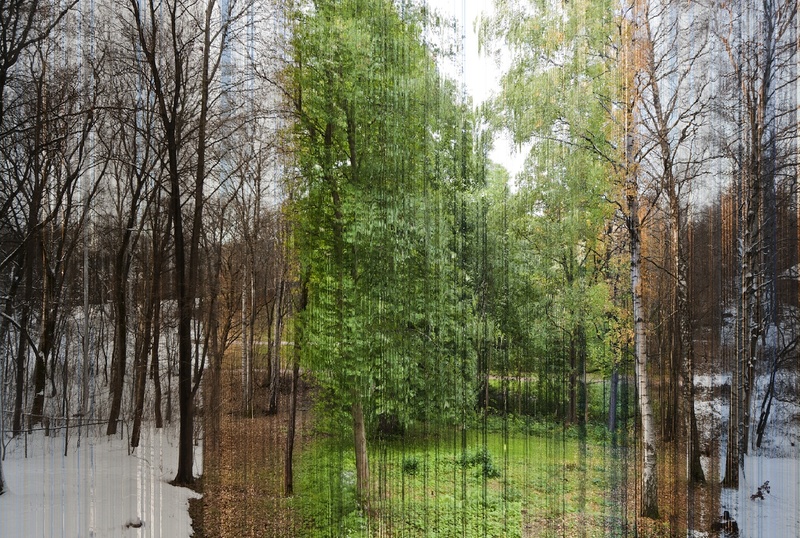 I am trying to build a high resolution image that consist of vertical lines from other images. To be exact: I want to build an image that is 3888×2592 pixels. 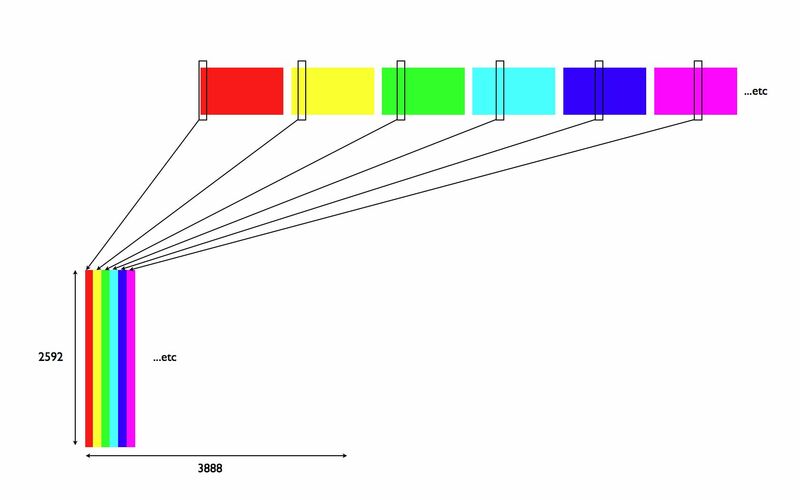 I want to build it using 3888 vertical lines that are 2592 pixels high. I have a folder with 3888 high resolution images and the new image should be build by extracting vertical line number one from the first picture, vertical line number two from the second picture, vertical line number three from the third picture and so on. …the problem is that I have no idea what tool to use. Could this be programmed using automator and apple script? Using automation in photoshop? Or do I need to learn xcode and do it the hard way? Preferably a solution that could be done on a Mac.